Jodie Carey: Earthcasts, Installation View, 2017. Edel Assanti. Carey’s recent work has explored the most basic and fundamental methods of art-making, including carving, weaving and wall-drawing. 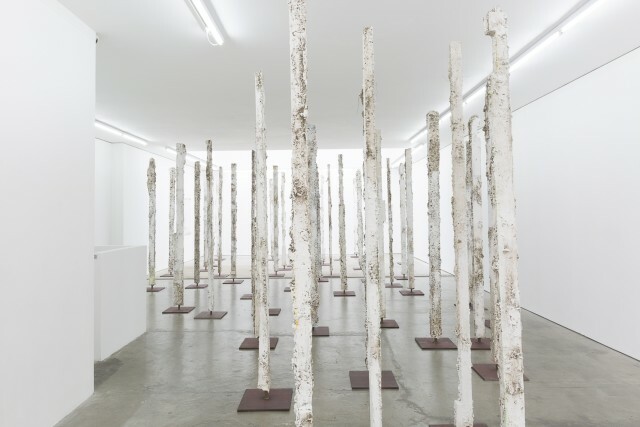 The earthcasts are produced by casting directly in the ground: Carey buried lengths of decades-old salvaged timber in the soil, lifting them out to form rudimentary moulds. Into these imprints she pours plaster which, once solidified and excavated, bears remnants of the soil, stones and plant roots absorbed during this process. Jodie Carey studied at Goldsmiths College, completing an MA in sculpture at The Royal College of Art in 2007. Solo exhibitions include ‘Early Old’ at Galerie Rolando Anselmi, Berlin (2016), ‘Dark Night by Daylight’ at Hå gamle prestegård, Norway (2014), ‘Shroud’ at Tieranatomisches Theatre Humboldt University, Berlin (2013), ‘Solomon’s Knot’ at the New Art Gallery Walsall (2012) and ‘Somewhere, and Nowhere’ at Pump House Gallery, London (2011). Recent group exhibitions include ‘Summer Exhibition’, Royal Academy of Arts, London (2016), ‘The London Open’, Whitechapel Gallery, London (2015), and ‘Women to Watch 2015’, The National Museum of Women in the Arts Washington in London (2015). Carey lives and works in London.